In the month of January 2016 Staat van Beleg could list 492 human right violations (and 151 reports/analyses). To give a better insight of the numbers of violations/character of the incidents we hereby provide you with an overview which mainly focuses on numbers. Israeli army deployed military reinforcements including artillery batteries in the vicinity of Gaza Strip in the wake of killing a Palestinian man after alleged attempt of planting of mines in northern Gaza Strip. Chief Israeli rabbi calls for executing Palestinians. The Israeli court has endorsed a new law that allows issuing prison sentences against Palestinian children. Israeli army fires into south Lebanon struck the town of Wazzani in the Hasbaya district of Lebanon’s Nabatieh Governorate. More than 7,000 explosive remnants of war are estimated to remain in the blockaded Gaza Strip. Prisoner Affairs, Accusations, Court Hearings etc. Palestinian lawmaker Hatim Rabah Rashid Qafisha sentenced to four months in administrative detention. The Israeli Prison Service (IPS) continues to prevent winter clothing, blankets, and heating materials’ access in the Negev prison. An Israeli court ordered the immediate, unconditional release of Palestinian human rights defender Nasser Nawaja on Thursday, but as of Friday morning he remained in custody. An Israeli court has rejected the appeal of a Palestinian prisoner, Thaer Halahla, being held by Israeli authorities under administrative detention without charge or trial. An Israeli court has ordered the release of prisoner Fathiya Khanfar, an elderly woman in her 60s from Silat ad-Dhahr town in Jenin, but her jailers still refuse to respond to the court verdict. A ban on bringing in books in prisons. A 23-year-old Palestinian circus performer Mohammad Abu Sakha enters his second month of administrative detention in Israeli prison. Mamdouh Abdulhaq, 25, from Nablus, was charged with 14 months of actual imprisonment and 18 months of suspended sentence for the charge of incitement on Facebook. The Israeli Supreme Court turned down the appeals filed by the Palestinian hunger-striker Muhammad al-Qeiq to end his administrative detention and restore his freedom. HaEmek Hospital has prevented the entrance of a volunteer physician from Physicians for Human Rights – Israel (PHRI) to see Muhammad al-Qeiq. The Israeli government has decided to demolish 83 family homes of Palestinian attackers as a punitive measure for stabbing, shooting, and vehicular attacks in occupied East Jerusalem and the West Bank. The Israeli Supreme Court refused to reconsider a decision to demolish the unrecognized Bedouin village of Umm al-Hiran, and ordered to evict all its ca. 1000 residents. Demolition of barn as a shelter for animals in Jin Safoot (Tulkarem).Israeli bulldozers razed al-Aragib village for the 93rd time under the claim it lacks construction permits.Incorporate a southern West Bank church compound into the Gush Etzion settlement bloc.A newly-approved Druze town is slated to be built atop destroyed Palestinian villages. 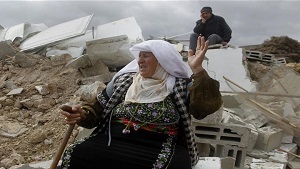 Israeli forces tear down plant nursery near Nablus, bulldozers razed the nursery that belongs to Fahd Odeh. Israeli forces demolished cement walls surrounding 500 square meters of land which belonged to Saleh Mahmoud Jabawbrah near Beit UmmarIsraeli forces demolished a Palestinian-owned barn and structure near the Beit al-Baraka church,in the southern West Bank district of Hebron. Israeli forces demolished four greenhouses and a water well in the Jordan Valley of the occupied West Bank. Israel is taking advantage of 30 nature reserves in order to steal 10 per cent of West Bank lands through expelling Palestinian farmers and confiscating their lands. The Israeli Occupation Authority (IOA) is scheduled to declare in the coming weeks that 1,500 dunums (roughly 1.5 million square meters) of land near Jericho as “state land”. Israel has begun building a fence along its border with Jordan. Haaretz newspaper reported that 50,000 Palestinian homes are threatened with demolition in 1948 Occupied Palestine. Restrictions on Water, Electricity, Goods, Customs, Liberty, Censorship etc. Keeping the Rafah crossing closed. Withholding the bodies of victims: the bodies of 3 Jerusalemites would be returned only under the condition that they will be buried outside of the separation wall that splits occupied Jerusalem. 9 bodies were returned and 14 bodies of victims were finally laid to rest. Shortage of classrooms East Jeruzalem. Preventing the Athan, call for prayer, (for over 600 times in 2015). United Nations special rapporteur on the situation of human rights in the Palestinian territories, is denied access to the West Bank and Gaza. A ban on the Northern Branch of the Islamic Movement and freeze all its bank accounts and assets has also hit the various charitable associations that relied on the political movement. Palestinian cartoonist Omayya JOha’s facebook page was blocked because of her pro-Palestinian cartoons. The Israeli occupation authorities (IOA) gave orders for immediately halting the digging of a water well in the southern occupied West Bank province of al-Khalil and seized a set of digging equipment. Gaza faces harsh winter after Israel cuts gas supply worsening bitter cold weather conditions. Gazans have increasingly become dependent on firewood to keep warm. Gaza power plant to shut down due to lack of fuel and Israeli authorities have refused to repair a major power line which supplies the Gaza Strip with electricity. Several Palestinian soccer players of the al-Khader team, in the al-Khader town, south of the West Bank city of Bethlehem, suffered severe effects of tear gas inhalation, after Israeli soldiers fired gas bombs on them during training. Palestinian refugees in Lebanon took to the streets in Tripoli on Thursday to protest against UNRWA’s decision to reduce the medical and educational services it supplies to the refugees due to lack of funds. Israeli police suppressed a meeting of the Islamic Movement in occupied East Jerusalem, using tear-gas and stun grenades. The Israeli occupation authority (IOA) has decided to put more restrictions on the travel of Gaza-bound cargo trucks on the roads used by Jewish settlers during rush hour. Palestinian female cancer patients participated in a sit-in in Gaza this week in order to protest Israel’s refusal to allow cancer women patients from Gaza to cross into Israel to seek medical help. Gaza Zoo Animals Are Suffering. Israeli forces confiscated trucks and equipment being used to build a new agricultural road in the Palestinian village of Khirbet al-Dir in the northern Jordan Valley. Israel still bans the shipment of 400 different kinds of raw materials to the Gaza Strip that are used in industry. Airbnb is enabling anyone to rent rooms and vacation homes in illegal Israeli settlements in the occupied West Bank. 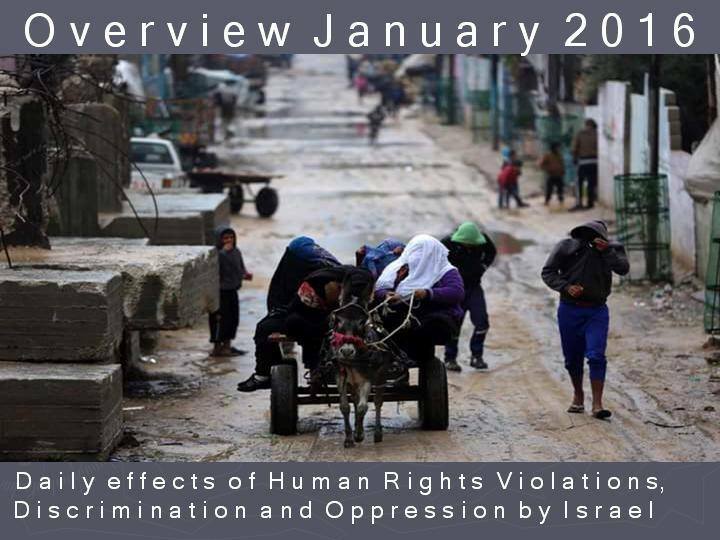 Read the full list of 492 human right violations and 151 reports/analyses online (with links). Download the full list of 492 human right violations and 151 reports/analyses (with links) as PDF-file. Thank you for the work involved in this effort!